Pretty dresses easily capture one's attention, but basics build the wardrobe, even if it happens to be in the need of a Comfy Outfit. And I LOVE this new outfit!! Sooooo comfortable with rayon spandex knit fabrics. Top fabric from Hobby Lobby (no online link, sorry!) and pants fabric is the Kathy Davis 'Blue Dot' from Joann Fabrics. You might remember the little top shown the other day made of a remnant from these pants. LOVE this fabric!! 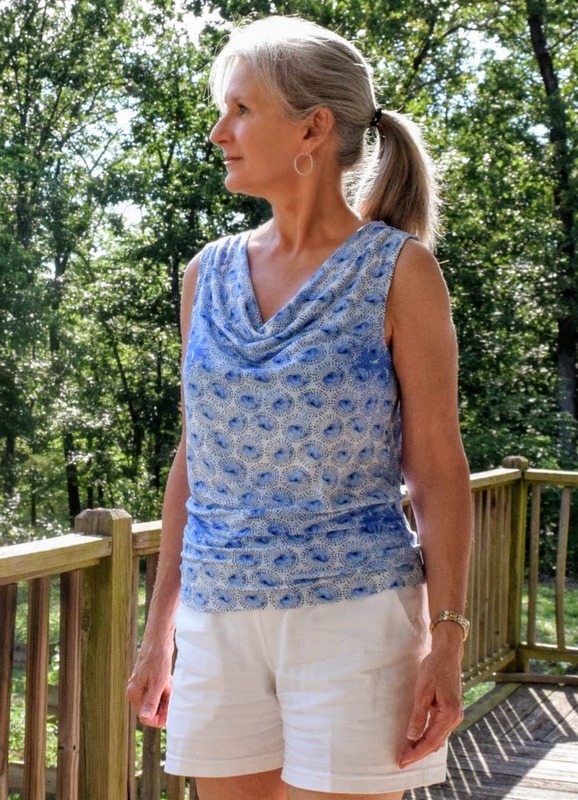 And this little top was made from a remnant from the Burda Yoga Top. So save those remnants and check your patterns for simple tanks and sleeveless tops. It's like getting a new top for 'free' or something. Let's talk more about the top first, then the pants. Thought I'd combine the 2 in today's post. 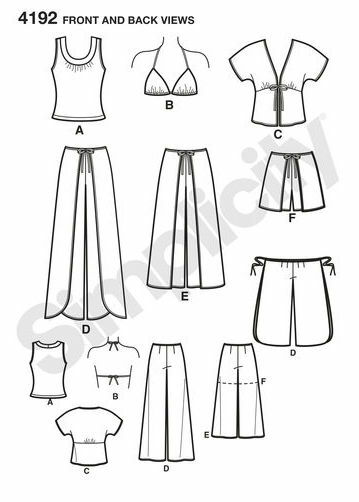 A quick Google search will show Simplicity 4192 is a pattern most folks pick up to sew the oh-so-cool pants, with very few focusing on the little tank top. These type of tops are fantastic wardrobe builders..... a tank with some interest..... and are great to wear on their own, or layer. I made View A per pattern, cutting a size 12, sewing 5/8" serged seams and modified the neckline to make it more tidy. And gosh, after another quick search on Simplicity's site, this pattern is not to be found. Is it OOP?! Kinda' shocked as thought the pants were pretty popular. The neckline on the coral top turned out fine, because the fabric had some body to it. I've worn this top many times and the neckline still stands up nice against the chest, like this below. But this oh-so-soft and luxurious rayon spandex produced a floppy neckline. Thinking I could simply press it out, my iron left shiny marks and it seemed to look worse. This is when the top was deemed to be a comfy top because it looked too sloppy to wear outside the home. You can see a little below of how it flopped and had a weird gape when being worn. Even a close up to show the double-needle stitching I was so proud of, shows the wrinkling and floppiness far right. Sitting juuuuust right, the neckline flopped back against my chest, but it still looked untidy for the photo of what I wore on Day 19 Me-Made-May 2018 and continued to bug me. And now it's all fixed and I am ever so happy!!!!!! Okay, let's look at the final construction on this cute top. This is the modified neckline below. And now side-by-side. Big difference, no?! Eventually figured the neckline just needed to be folded over onto itself and stitch a 3rd seam to hold it down. So that's what I did and now it is absolutely perfect. At first, I was afraid it'd make everything too low, but it doesn't. I love this so much, am thinking the next version I make, will incorporate this feature during construction. I biggified the not-so-great-focused photo so you could see the 3rd seam above the double-needle stitching at the neckline. Very proud of how I was able to catch the back edge with that 3rd seam at the neckline, as I was top-stitching. Figured it was more important to get the seamline even at the front than the back.... though the back doesn't look too shabby. On to the pants. If you've read this blog for any period of time, you know how much I love the NewLook 6216 pattern for pants. I've made so many versions of these pants, you only need to click on the label in the sidebar as there are too many to list. I've made corduroy, linen, cotton, flannel..... but never a pair out of knit. Until now..... and gee whiz, why ever not?! These are the best!! This pattern is easy to sew up, looks pretty good for an elastic waist pair of pants, comfortable to wear and great pockets!! *Heart* these pockets!! This pair was shamefully copied from the cute pair Sarah Liz recently made as I ran out of fabric for the pockets and waistband so used pieces from the blue. She also gave me the idea to make these out of knit. Thank you Sarah Liz!!! Below you can see what I'm talking about a little better. Cut my regular size 8 sewing/serging a 3/8" seam. So easy. I can knock a pair of these out in an hour or so after cutting out. Also I treated the waistband completely different this time. Used a 1 1/2" piece of elastic, cut 27" with no overlap and serged on to the waistband. There is no casing. To do this, I had to attach the bottom of the waistband to the top of the pants first, serged elastic to the waistband's free edge, then turned in and top-stitched. Before top-stitching, I was careful to turn all the inner waistband seams underneath the elastic and 'caught' all that in the top-stitching. Makes for a super comfortable wear. I will definitely do this technique again and these pants feel great with a wider elastic. And because I was running out of the blue, I split the pocket bags and made the outer bag blue and the inner (unseen) bag white rayon spandex. Needless to say there was n.o.t.h.i.n.g of the blue dots, nor the soft blue fabrics leftover. Nice. This outfit closes out the 'blues' for now. What a great looking outfit! You are making me add new patterns to my shopping list. :) The top and pants are definitely my kind of style. I too make homemade pizzas on Friday night. What a great stay at home outfit! Great use of scraps and a great testament to your perseverance to get that top's neckline to your liking. Like you I don't have a lot of at-home comfy clothes. It might be because neither one of us works outside of the home so are wardrobe is already casual. Even if this is the only house wear outfit in your closet, you will get lots of enjoyment out of it. What a great use of „scraps“, Lisa! Looks as if you had looked for the fabric especially for this project and the blue is suiting you so well! I love how you have saved the neckline. What a difference! I was never successful with the double needle and didn‘t want to loosen the bobbin case tension out of fear not getting it right afterwards. I have bought a cover stitch machine at a sale (which I use quite rarely). Afterwards, I heard that you could buy a second bobbin case which tension you can put down and use it for your double needle. You are always inspiring and I always enjoy learning from your posts Sarah Liz! Yes!! This is such a great outfit Lisa, and your solution for the floppy neckline is so creative and worked so well. Good work all round!